Valls, a naturalized French citizen born in Barcelona, is at age 51 an up-and-coming star of the French center-left. 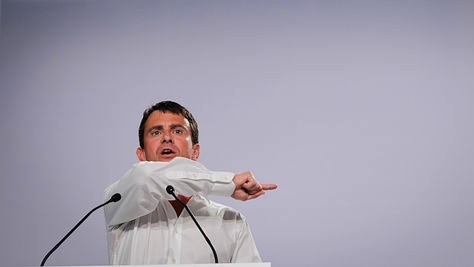 A Socialist deputy in the Assemblée nationale (National Assembly) since 2002 and mayor of Évry since 2001, Valls waged a largely quixotic campaign to become the Socialist Party’s presidential candidate in 2012. In the first round of the October 2011 primary, he won just 5.6% of the vote, however. He subsequently endorsed Hollande, and he ultimately served as Hollande’s campaign communications chief. When Hollande became president, he appointed Valls as his minister of interior, and in many ways, Valls’s ascent neatly parallels the rise of former president Nicolas Sarkozy rise a decade ago. Valls is the most prominent figure from the Socialist Party’s right wing and like former British prime minister Tony Blair and former German chancellor Gerhard Schröder in the late 1990s, or like Matteo Renzi in Italy today, Valls is a pragmatic, business-friendly centrist who would pull the Socialist Party away from its leftist roots. Valls would arguably drag the left beyond the more social democratic orientation of Hollande and Ayrault to a more populist gauche républicaine, or ‘republican left.’ In his bid for the 2012 nomination, he supported ending the 35-hour work week and introducing vast labor liberalization reforms. That’s not unlike Sarkozy’s effort to pull the Union pour un mouvement populaire (UMP, Union for a popular movement) further to the right to counter the rising popularity of Marine Le Pen’s Front national (FN, National Front), in contrast to the often aimless ‘Gaullism’ that marked the 12-year presidency of Jacques Chirac. Valls, in his position as interior minister, has taken a similarly strong line on crime and immigration, much as Sarkozy did when he was interior minister in the mid-2000s. He has continued the practice of destroying illegal Roma camps in France, and he’s spoken out against the Roma, a group that’s extremely politically unpopular in France. Though the Roma includes both foreign-born and French-born individuals, Valls has criticized the Roma for their failure to integrate into French society. It’s not the most welcome view with the French left, and Cécile Duflot, housing minister and a former national secretary of Europe Écologie – Les Verts (EELV, Europe Ecology – The Greens), severely reprimanded Valls last year for his hard line against the Roma. Despite his wider popularity, Valls’s positions have caused some recent difficulties for him even beyond the hard left. Last autumn, the affaire Leonarda caused the first major firestorm of his political career. The controversy stemmed from the government’s arrest of 15-year-old Leonarda Dibrani, a Roma girl living illegally in France with her family. Officials arrested Dibrani during a school field trip and subsequently deported her and her family to Kosovo. In light of the French government’s pre-existing practice not to arrest the children of illegal immigrants while in school, politicians from across the entire ideological spectrum criticized the interior ministry’s actions. More recently, critics have attacked Valls’s commitment to basic political freedoms after he encouraged local governments to ban public appearances by Dieudonné M’bala M’bala, a comedian whose anti-Semitic remarks and views have become increasingly controversial over the last decade. Though French laws arguably allow Valls to restrict such appearances, his decision met with criticism from both the right and the left. Valls’s critics believe that Dieudonné could attract even greater attention if he sues the French government — and wins. Valls’s selection today as prime minister is certain to depress much of the Socialist Party’s base, which would have preferred Martine Aubry, who served as labor minister in the early 1990s and as social affairs minister from 1997 to 2000 under prime minister Lionel Jospin, where she won international fame for authoring the law establishing France’s famous (infamous) 35-hour work week. Though Hollande’s decision to appoint Valls is not unexpected or surprising, it marks somewhat of a rupture from Hollande’s leadership style and comfort zone. In both his campaign and in the presidency, Hollande has been more comfortable with appointing longtime supporters and advisors, including Ayrault and Moscovici. Hollande might have turned instead to Laurent Fabius, France’s foreign minister, who is responsible for steering France through a largely successful intervention to end Mali’s civil conflict in 2012. But Fabius first served as prime minister from 1984 to 1986, and his anti-constitution stance in the 2005 European constitutional referendum would have made Fabius an unpopular choice in Berlin and Brussels at a time when France’s leadership role within Europe seems to be fading. Back in 2012, many commentators believed that Ayrault, who speaks German, would help smooth the differences between the leftist Hollande and the more conservative German chancellor Angela Merkel. It didn’t — and European policy today is directed increasingly less by Franco-German collaboration and increasingly more through exclusively German political, economic and financial leadership. Throughout the Fifth Republic, prime ministers have typically taken much of the political heat when the same party controls the presidency and the National Assembly. Former prime minister François Fillon was an exception — not only did he remain in Matignon for all five years of the Sarkozy presidency, he did so with routinely higher approval ratings than Sarkozy. Most recently, Ayrault and Hollande have been advancing a relatively more pro-business ‘responsibility pact,’ which aims to lower France’s payroll tax, while enacting more reforms to the French pension system and its labor laws. Those changes would confirm Sarkozy’s previous efforts to raise the retirement age from 60 to 62. Hollande unveiled the agenda in January as a means of resetting his government’s agenda, but it was largely overshadowed by Hollande’s romantic woes and his split with partner Valérie Trierweiler. Photo credit to Jean-Claude Coutausse / Le Monde.